Weep-Armor™ protects weep vents from clogging with mortar and debris, while providing a path for water to reach the weep vents. 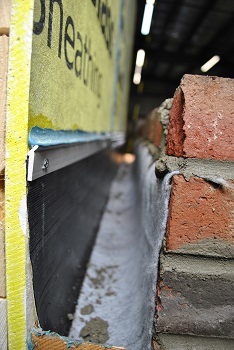 Weep-Armor™ eliminates the worry of mortar bridging, insect infestation through the weeps and it promotes air flow in the cavity wall. Weep-Armor™ is made of polyester strands for life of the wall performance. One size fits cavity spacing 1"-6"